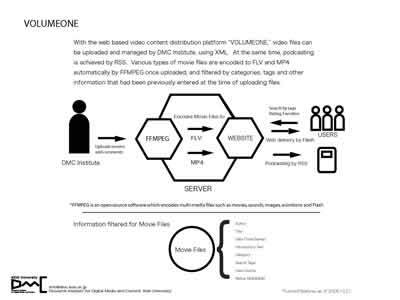 VOLUMEONE was introduced by a team led by Prof. Junko IWABUCHI of the Research Institute for Digital Media and Content, Keio University, Tokyo, Japan, in May, 2006, as a prototype multi-channel video presentation platform on the Web. It is designed to host museums of various disciplines to distribute their in-house-produced educational video programs for audiences of K to 12 Schools, Universities, adults, and children in hospitals with long-term illness who require educational and intellectual entertainment programs without going outside. Prof. Iwabuchi's firm belief is that more diversified use of museum content will be a great service to those mentioned above, and with that in mind, her team created a video content distribution platform that is easy to manage for the administrator and graphically attractive for the audience. Since its introduction in May 2006, there have been some alterations done to the original platform. New features have been added since October, 2006: Pod-casting, rating by the audience, sorting by categories, and search tags. The visual appearance is also slightly different now as the current platform is not in multi channels, but in a single channel with categories and sort-by search tags. A new section distributes “news” independently of video files. 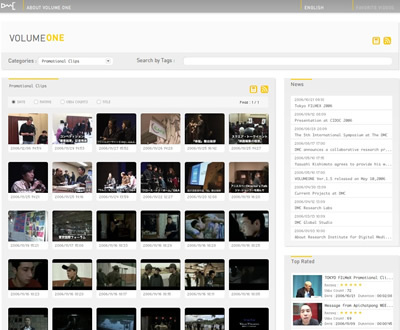 In the beginning, VOLUMEONE was created as a response to under-funded smaller museums that wished to have video-casting programs on their own Web sites. Now VOLUMEONE offers much more: it features added functions such as pod-casting, rating by audience, sorting by categories, and search tags. The platform can also distribute ‘news’independently of video content, and it still maintains features from the original version, such as "share this video with friends by E-mail," "create a link to this video," "paste this video to your Web site or to your Weblog", all by just one click. Fig. 1: Current view with trailers and interviews from the Tokyo FILMeX, international film festival of independent film makers with focus on Asia, on the VOLUMEONE http://www.volumeone.jp N.B. : Once you enter the Web site, select “English” before clicking on to any of the images. Also, please make sure to install the newest version of Adobe/Macromedia Flash Player (currently, Ver.9, or newer) to watch video clips on VOLUMEONE. The long and interesting story for museum professionals about why the author, Prof. Iwabuchi, became interested in such a project was already mentioned in detail in her paper presented at the CIDOC meeting in Gothenburg, 2006 (Iwabuch 2006). To make a long story short, everybody supported her idea because such a commitment seemed quite appropriate for a research institute at a University, an ideal intermediary between museums and their audiences at large. So the team went ahead and created a prototype, using a small part of the existing server at the institute. The time spent for implementation was about 2 months: this was achieved without making any new purchases except the fee paid for obtaining a new domain on the Web. The video clips here on these sites are provided to DMC Institute under direct agreement with the original author of each clip, and the general terms and conditions for users can be viewed on the Web site. In order to explain exactly what VOLUMEONE does, let us start by describing what VOLUMEZERO, the original version in multi-channel, does. 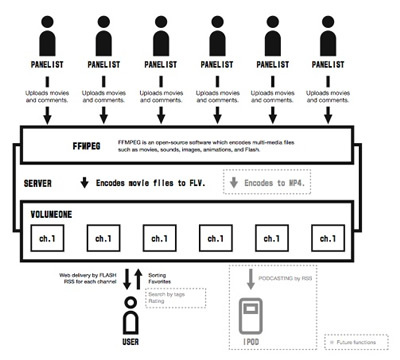 Using VOLUMEZERO, museum program administrators (shown as Panelist here in Figure 4) with assigned ID and a Password issued by theDMC Institute (the administrator of the whole platform itself) can upload their movie files on the Web wherever they are and make these files video-castable by flash video Web streaming almost instantly. A unique feature of VOLUMEZERO since the time of its release is that each video file is assigned a permanent link so that just one click produces a link to that particular video. It is also equipped with a button to produce a script to transport video clips to Web pages and Web logs run independently. 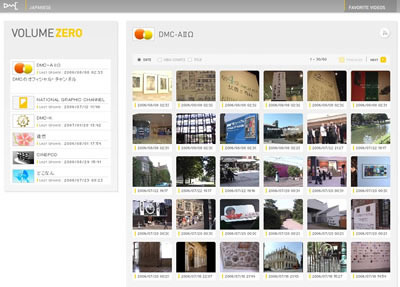 With a little help by VOLUMEZERO, museums could fill their Web sites with video content by using the paste-up video function. Now let's take a look at VOLUNEONE, the current version. The team at DMC institute started the testing of the new VOLUMEONE in late August. (They were preparing for a sneak preview at the time of the CIDOC conference in Mid-September, but the official date of release was not until October 23, 2007). The most dramatic change with this version is the start of video pod-casting via i-Tunes and the addition of a section to distribute news independent of descriptions of video content. Now users can search for content regarding their interests by using categories such as "museums," "history," "short movies," etc. and by key words or search tags. The DMC Institute at Keio University launched a year-round collaboration with Kawasaki City Museum in August, 2006 (Kawasaki), and after the official release of the new VOLUMEONE, the team helped Tokyo FILMeX , the international film festival of independent film makers with focus on Asia (Tokyo), with both Web- and pod-casting their promotional trailers and doing interviews with directors and actors on the spot everyday. Where Does VOLUMEONE Go From Here? As an educational institute, we don't mean to interfere with the interests of producers of museum audio tours. Our purpose is to explore the possibilities to enhance the multi-media capabilities of museums' educational programs so that those who love museums yet cannot come to the museums due to restricted mobility have a better chance of enjoying museum content off-site. Since VOLUMEONE can so easily and quickly upload any video files, museum staff could make a new presentation and upload it almost every day, or take full advantage of existing video archives within their institutions and show them all on the Web. They can choose, or not choose, to pod-cast these programs to be downloaded to MP4 players. With its easy-to-upload capability, a museum staff member with a DV Cam could ask a group of ten-year-olds to tour with him and then capture comments by these kids as they walk through galleries. The video clips could be made available on the Web for public viewing a few hours afterwards. Such lively comments that only real 10-years-olds could give, with moving images of their faces and with exhibition and other activities going on in the background, would be a gift to kids of the same age in hospital. At the same time, an elderly group might enjoy watching the kids having a good time in the museum; it would remind them of the museum atmosphere and provide a physical sense of being there with young people. We hope VOLUMEONE will continue to provide alternative ways to enhance museums’ normally more structured official educational programs. VOLUMEONE is, basically, a flash-based video content distribution platform very much like YouTube, if you are familiar with their service. But it is not open to a mass audience to upload their own materials. It provides a more controlled and clean-looking environment without any advertisements and is operated like a club of not-for-profit organizations approved by the DMC Institute/Keio University as research partners for collaboration. However, the future of VOLUMEONE still lies in ambiguity. Whether it goes open source entirely, or goes into a service by the DMC Institute/Keio University itself, or launches a new business in partnership with a private company that specializes in consultancy to the not-for-profit sector, will be an institutional decision taken within a few months. In case the Institute chooses the 3rd alternative as the destiny of VOLUMEONE, open source software FFMPEG, used for encoding flash video, will be replaced by original technology developed internally. For the time being, DMC Institute/Keio University welcomes any interest from museums for collaboration. Please feel free to make contact any time during the conference, or by E-mail. For the development of VOLUMEZERO and VOLUMEONE, many people have contributed their talents and valuable time. I would like to express my special thanks to my colleagues Kim Junghoon, Hideki Ogino, Kentaro Hirano, Sasaki Nagi, Keiko Kinuta, Masaru Ando, Miho Ishii, Andreas Bovens, Junko Sawada, Yutaka Ohga, Maki Yamamura, and artists who willingly provided their materials for experimentation. I also would like to extend my sincere appreciation to a dear friend, Ms. Ritsuko Segawa, who inspired me to launch this project. She is definitely one of the best producers of audio tour guide for museums in Japan. Ms.Segawa was a long-time representative of Antenna Audio, London, for the Japanese market (until June 2005), and now has a close working relationship with Ophyris systems of France. Development of the VOLUMEZERO (introduced as VOLUMEONE at the time of its release on May 10, 2006) was made possible by the Special Coordination Funds for Promoting Science and Technology. The Research Institute for Digital Media and Content, Keio University, has been established as a part of the Encouraging Development of Strategic Research Centers Program of the Ministry of Education, Culture, Sports, Science and Technology, Japan.